Staci Murray introduced us to Origami Owl which allows you to personalize beautiful lockets with unique charms. As soon as I started browsing the jewelry a few months ago, I thought of my mom. We just had to make her a locket for Mother's Day! It was so meaningful to pick out the charms that reminded us of her. 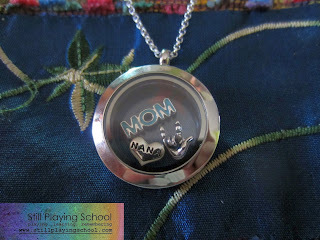 We chose a Nana charm, a Mom charm, and one that says "I love you" in sign language. I would sign this to my mom from the school bus window as it pulled away from the bus stop in the morning! We can add to her locket later with more charms, plates, and dangles. She loved it and we loved gifting it to her! 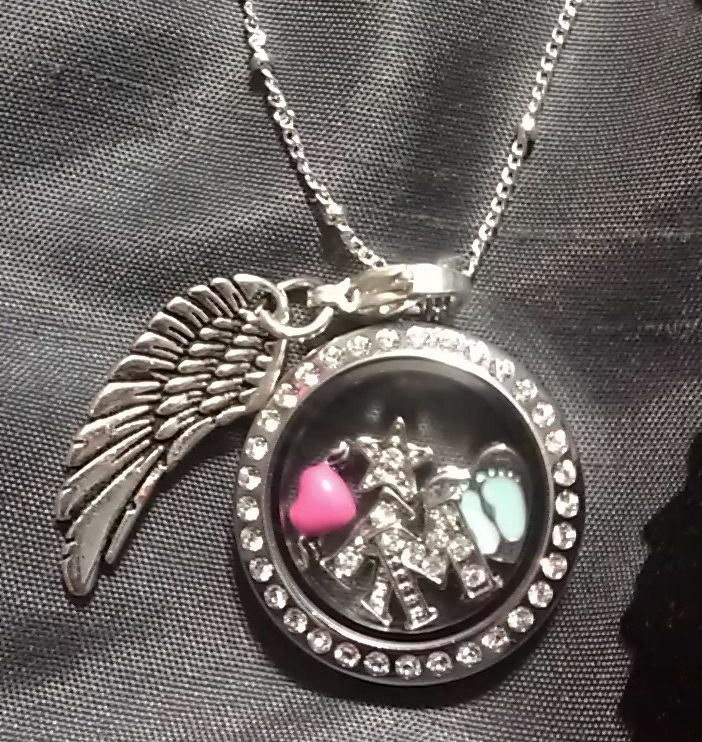 The beauty of Origami Owl also came up in discussion among one of my baby loss momma groups. 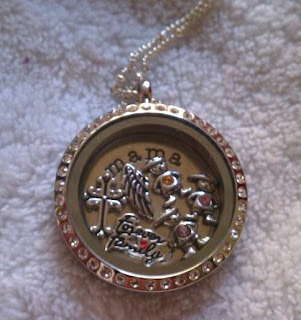 I would like to share with you how a few of my friends have remembered their sweet babies with these lockets. 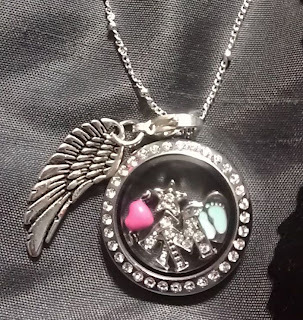 Here is my necklace for Kash McKinley. The crystal K & M charms are for his initials. I have a crystal star charm just because he is my star. I can't help but wonder what he's doing when I look up at the stars. I also have the heart with angel wings because he has my heart & he's my angel. Then I have the heart charm with the blue baby boy foot prints. I picked the ball station chain & the medium crystal locket, & then added the angel wing dangle. Kash was born April 11, 2011, & passed away April 19, 2011, from complications of severe Persistent Pulmonary Hypertension of the Newborn. I have a letter C for all my boys and the new owl that has the blue rhinestones. Owls became my sign for Collin. I was contacted after I lost Collin by a friend I hardly ever see. I found out talking to her that she had also lost a baby almost full term and a husband all within a year of each other. I never knew any of this and my heart just broke. She had contacted me because she felt so bad that we lost Collin and wanted to gift me an Origami Owl! I had never heard of them until then. Well, that was my first sign from Collin. After that every time I went to Pier 1 that card with the big owl on it and the 3 lil ones in the nest would be staring at me every night. Then every time I turned around a new owl would come in so I just knew that had to be my wink from Collin. My Origami Owl locket was given to me just recently by two friends of mine. They got the birthstone charm for each of my sons including my stepson along with a set of angel wings, a cross, and a Forever Family charm. The background inside the pendant says Mama. 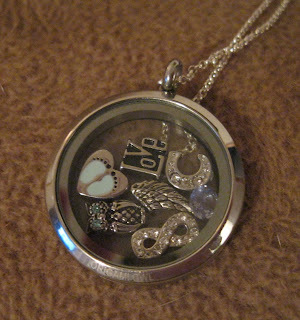 As you can see, there are endless possibilities for personalizing these lockets for whomever you choose. 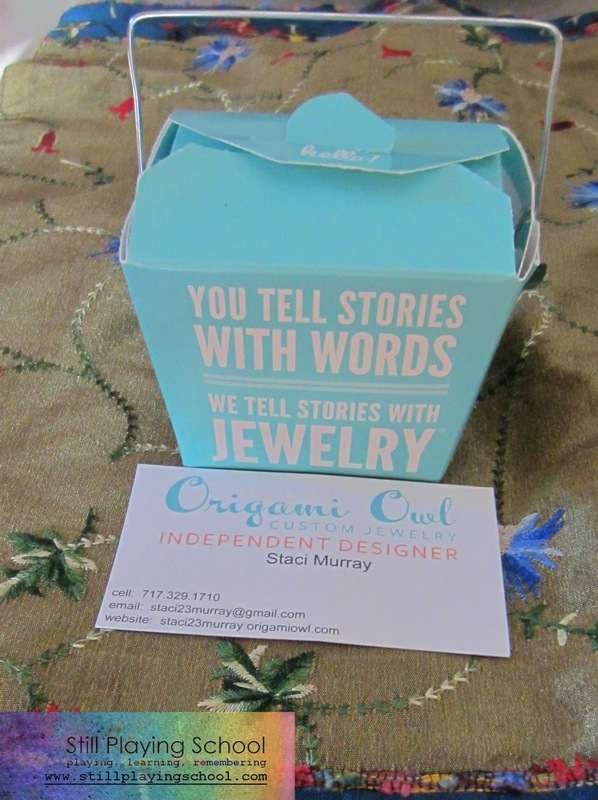 Staci Murray is generously giving our readers a chance to win a $25 gift certificate for her shop! Please refer to our Rafflecopter tutorial to make sure you entering correctly! Staci Murray, Origami Owl Independent Designer, allowed us to purchase our locket at a discount in exchange for writing this review. As always, the opinions and enthusiasm are 100% my own! I saw this from a fellow hydro mom, she had one with a blue ribbon for hydro awareness and then others pertaining to her family. I thought it was so cool! She is in NJ so I started looking into origami owl and was in love. I definitely want one!! This is great! I saw a lot of charms I'd love. I'd want it to represent my family! Oh, this is the kind of thing I just LOOOOOVE! I LOVE meaningful jewelry! 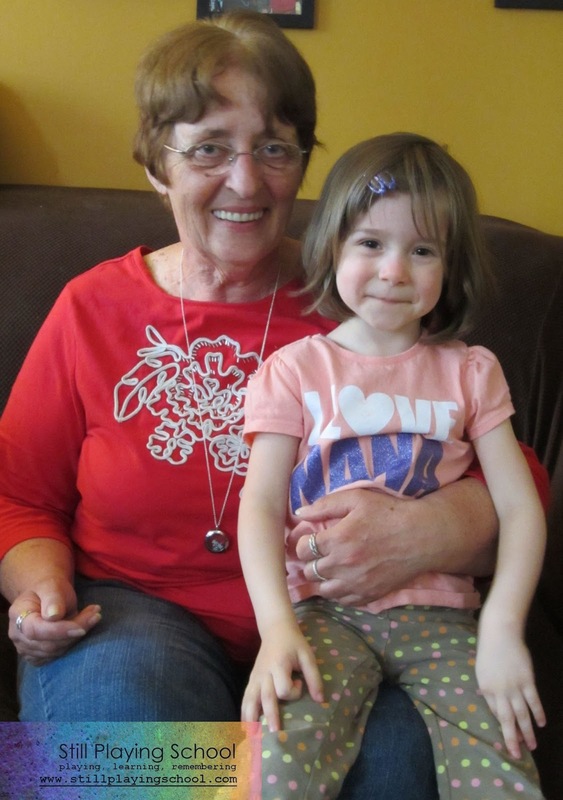 I was so happy and honored to receive this Mother's Day gift from my daughter and grandchildren. It means so many special things to me. I can't wait to order more charms and dangles. Thanks again to my wonderful daughter and grandkids. So beautiful and elegant. I've wore a tear drop urn necklace for almost 7 years with soke of my sons ashes. I treasure it to very much . I never take it off. 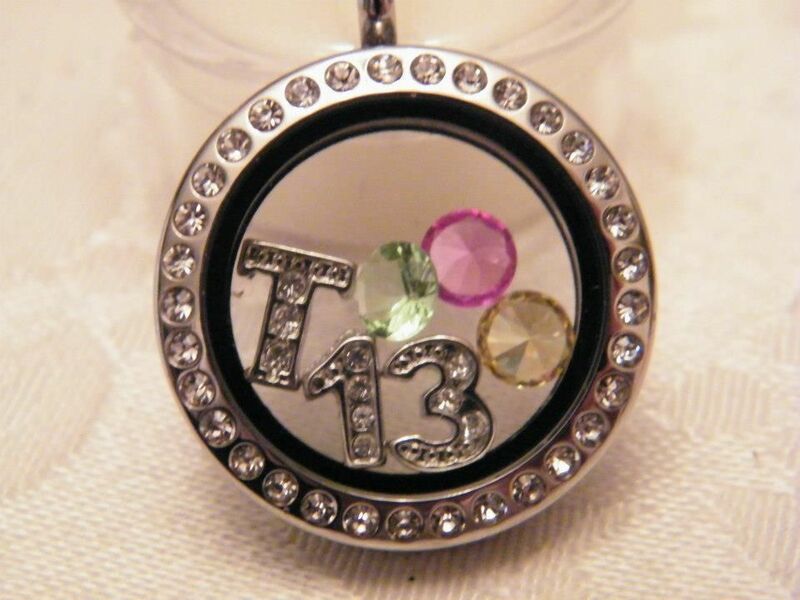 I love the stories of how others remembered their babies with their necklaces, especially the T13 one! I'd probably choose the footprint, Noah's initials and I don't know what else. I love that this jewelry can mean so many things to so many different people. It's beautiful not only to look at but to tell your life story. I can't imagine anything more difficult than losing a child. These stories just break my heart. I would choose charms to celebrate the two beautiful daughters I am blessed with, with birthstone charms, a cat charm (they are kitty crazy), an artist's palette, the infinity symbol in rose gold and the word Love. Staci did an Origami Owl party for me around Christmas. I love the jewelry. It's beautiful, meaningful, and personalized. I love the vintage style charms- the cross, rose, sparrow, cameo...all stunning! I'd really like one of these. I saw a brochure today when my son was getting his hair cut. I would the cat, snowflake, my birthstone, the coffee/tea cup, music note, and artist pallet. That is hard to pick. I like all the vintage collection and the birthstones. I like the breast cancer charm for my mom.